On October 26th 2011, reports of a bombing in Kham-Chamdo were coming out from Tibet. According to reports, the explosion of the Chinese government building happened at night, it is assumed, to make sure the explosion would hurt no one. Since then, I have seen this article surfacing at tibettruth.com. According to the writer (who I hear is a supporter), this could be a Chinese conspiracy to set up the Tibetans in the area. S/he writes “considerable doubt about Tibetan involvement in such a bombing.” There is a chance this could be true, but at the same time; Tibetans could have set off the bomb. I do, however, appreciate this person’s intentions. The Tibetans in Kham-Chamdo could also be targeting buildings that “represent oppression” strategically to send out a message to the Chinese that they are not only against the continued occupation of Tibet but they will strategically make it difficult for the Chinese to rule and control Tibet. Lets not forget, the Danish Resistance in the 1943 against Nazi Germany began with successful sabotage campaigns that helped them gain their Nations independence. The explosion in Kham-Chamdo could be the start of something great. The Tibetans inside are the ones taking all the risks, the least we Tibetans and our supporters outside can do is to challenge our own understandings about the broader meanings behind these isolated events. Which, if seen in a larger context, can be seen as not isolated but speak to the greater goal of a Free Tibet. In the lead up to Danish independence, Danes destroyed the Train tracks to prevent Nazi army from coming in to stop the revolution. Egypt Revolution: Protesters destroyed the roads and/or blockaded the roads towards Tahir Sq., to prevent the military from entering the square to stop the protest. While simultaneous worked on communicating to soldiers, who later came to their side. Tienanmen Sq: When the army first tried to prevent the protests in Tienanmen, they were stopped by civilians blockading the road who were able to speak to them and persuaded soldiers to turn back. Unfortunately, few weeks after, China brought a different band of soldiers from outside Beijing (who were unfamiliar w/ Beijing citizens) who carried out orders to tank through and crush the resistance in Tienanmen. The point is not whether sabotage campaigns are moral/amoral, violent/nonviolent. The objective of Sabotage campaigns are to get in the way of and/or prevent Colonial Administration from functioning (bureaucratically/logistically/etc.). This makes the overall Colonial control of Tibet, a difficult job. What we are seeing are sophisticated actions by Tibetans inside (see Lhakar) against the Chinese ruling body, this bombing can be viewed as such. Tibetans in Tibet are more than capable of embarking on a sophisticated strategic sabotage campaign against China’s ongoing colonization. I for one, see this as the beginning of a powerful campaign. I am writing to bring to your attention the creation of a new blog: “Le Tibet Invisible”. This new blog seeks to popularize within the Francophone community the writings of Tsering Woeser, by the translation of her texts, reflections and articles. The many restrictions that the Chinese government imposes on members of the Tibetan intelligentsia are known. We hope that this blog in its own modest way can carry the message of Woeser beyond China’s borders. We would be extremely grateful if you could share this news within your network. The best would be to include a link on your page or send a message to friends of Tibet. Interesting. As an American, I do not understand how the Chinese government can get by with this oppression for 52 years. Great to see someone not afraid to take a different stance on this issue. I think we are way too scared most of the times to even venture beyond the lines of outward compassion and peace. There definitely can be a lot of greater good from seemingly violent-looking actions (Although I don’t condone violence against people at all). Why be apologetic in advocating other solutions for Tibet? Remember, the Tibetan struggle against the invading Chinese force was violent. 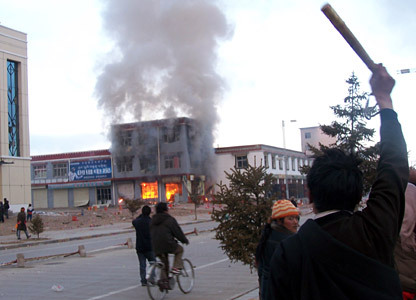 Even in the early 1990s, Tibetans in Lhasa bombed a Chinese government offices. Non-lethal form of violent protests should be encouraged. The myth of Tibetans being non-violent is shackling the movement. Could the reputation of His Holiness — as a ‘Man of Peace’ — be holding the struggle back? Why is our new Kalon Tripa riding on this perception of a non-violent Tibetans ready to appease to a Middle Way solution? Tibetan people are fed up and looking at getting back at the Chinese. Let them. I would like to point out that the picture attached to the above article was in fact taken in Machu town (Gansu province) during the 2008 demonstrations and was NOT the government building that was bombed and referred to in this article. Please ensure you source your pictorial information correctly as sloppy journalism simply gives the CCP more fuel to undermine the Tibetan freedom movement with. Thanks for pointing that out. I will make sure to edit the picture info. Also, this post was not meant to be journalism but to act as an opinion piece. But thank you for pointing out the necessary facts.